“Time is an illusion of control,” shouts one of Studio De Cirque’s daredevil quartet in this show in three parts. 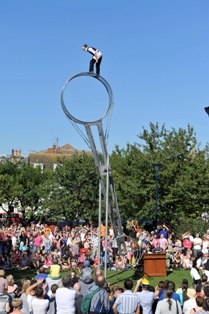 Control is certainly what is demonstrated as the four artists turn the massive 10m wheel of death into a circus plaything. 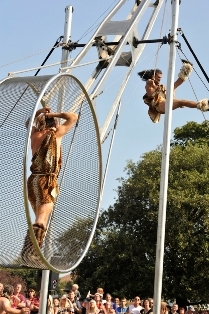 Spinning inside, walking the outside, and suspended from within, they dazzled the crowds with exceptional synchronised control, astounding skill and several heart-in-mouth moments. Through three shows, they move a loosely woven narrative on ‘time’ from cavemen, through modern times, to some future period at the world’s end. With the finer nuances of the story perhaps lost in translation, it was the middle of the three shows which was received best. Set in a French cafe, and performed to the distinctive music of Edith Piaf, it had a delightful French flavour that made it one of the stand-out shows of Out There 2012.